Located in the Sellaronda – giro dei 4 passi (Dolomiti Superski circuit) ski resort, Hotel Col di Lana is located at the top of the Pordoi Pass, at 2239 meters above sea level, right in front of the Sass Pordoi cableway, surrounded by a breathtaking view that offers a view of the Fassa Valley and the Dolomite peaks. Thanks to its extraordinary location, appreciated by every mountain lover, the hotel is the ideal starting point to access the ski slopes of the Dolomiti Superski circuit and the thrilling hiking and mountain bike trails. 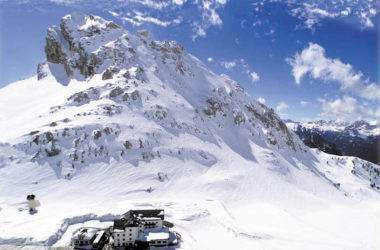 During the winter, the Col di Lana hotel offers the possibility to leave, with your skis on for the slopes of the Giro dei Quattro Passi (Sellaronda) and discover one of the many areas of the beautiful ski tour. In the summer enjoy a holiday filled with nature, relaxation and sports. 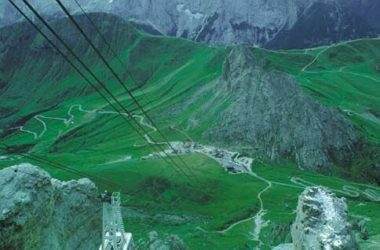 In fact, the hiking and mountain bike trails, scenic walks and excursions and the Sass Pordoi cableway, which arrives up to almost three thousand meters above sea level, on the Dolomite Terrace start from the hotel. From the A22 motorway (leading to the Brennero), exit at Ora/Egna and follow the directions for Val di Fiemme and Val di Fassa up to Canazei (45 km journey); if you exit at Bolzano Nord, continue on the SS241, on the Grande Strada delle Dolomiti, in the direction of Val di Fassa, up to Canazei. Once you have passed the center of Canazei, take the road for Passo Pordoi at the roundabout and continue for 12 km up to Hotel Col di Lana. If you travel by train, the closest railways to Canazei are those of Trento (120 km) and Bolzano (90 km). Canazei is connected to these cities with a bus service that leaves from the train station (change buses in Predazzo). From the airports of Venice (195 km) and Treviso (157 km), take the A27 motorway to Belluno. Then pass Belluno, Agordo, Passo Fedaia and Alleghe up to Canazei. From here reach the hotel by following the road that leads to Passo Pordoi. If you land at the Verona airport (190 km), take the A22 motorway up to Bolzano and then follow directions listed under "By Car". Canazei is also accessible by bus with weekly connections departing from the major cities of northern Italy (Milan, Venice, Parma, Mantua, etc. ).